2003-12-08 Assigned to GENOA TECHNOLOGIES LTD. reassignment GENOA TECHNOLOGIES LTD. ASSIGNMENT OF ASSIGNORS INTEREST (SEE DOCUMENT FOR DETAILS). Assignors: GENOA COLOR TECHNOLOGIES LTD.
2005-08-21 Assigned to GENOA COLOR TECHNOLOGIES LTD. reassignment GENOA COLOR TECHNOLOGIES LTD. CHANGE OF NAME (SEE DOCUMENT FOR DETAILS). Assignors: GENOA TECHNOLOGIES LTD.
2010-07-19 Assigned to SAMSUNG ELECTRONICS CO., LTD. reassignment SAMSUNG ELECTRONICS CO., LTD. ASSIGNMENT OF ASSIGNORS INTEREST (SEE DOCUMENT FOR DETAILS). Assignors: GENOA COLOR TECHNOLOGIES LTD.
A device, system and a method for soft proofing of an image before it is printed onto printed material, such that the colors of the image substantially reproduce, to the human eye, the colors as they should appear on the printed material. This application claims the benefit of prior provisional application No. 60/255,914 entitled “Spectrally Matched Digital Print Proofer” filed on Dec. 18, 2000 and prior provisional application No. 60/306,764 entitled “Display for Simulation of Printed Material” filed on Jul. 23, 2001. Hereinafter, the term “subtractive” refers to the creation of color by removing a portion of the spectrum of light transmitted to the eye, while the term “additive” refers to the creation of color by combining light of at least two spectra before transmission to the eye. FIGS. 7A-7C illustrate an implementation of an embodiment of the present invention with an exemplary neutral density (ND) filter, with an illustrative implementation for the filter arrangement of the color wheel with such an ND filter (FIG. 7A), the timing sequence for operation of the color filter wheel (FIG. 7B), and a graph of the density of the ND filter (FIG. 7C). FIG. 9 a depicts the spectra of a lamp currently marketed as the Osram™ VIP lamp. FIG. 9b depicts the spectra of a D50 equivalent fluorescent lamp. FIG. 9c depicts a spectrum of a correction filter according to an embodiment of the present invention. FIG. 9d is a spectrum created using a correction filter, according to an embodiment of the present invention. FIG. 11 depicts a series of steps for displaying an image of printed matter to be proofed according to an embodiment of the present invention. As shown in FIG. 2A, a system  36 according to one embodiment features a light source 38 for producing light of preferably seven elementary colors. In one embodiment, these colors are C, M, Y, R, G, B and white, fitted in transmission spectrum to that of a certain set of inks and paper under certain illumination conditions. In one embodiment, one filter or primary source is used for each primary; in alternate embodiments lower numbers of primaries may be mixed in the proper proportions to reproduce with some accuracy a higher number of transmission spectra colors. The light from light source 38 is displayed on a viewing screen 40, thereby enabling the human viewer to see the colors of the displayed image (not shown). Preferably, the light from light source 38 is projected onto viewing screen 40. In order for each color to be properly displayed in the correct location of the displayed image, a controller 42 controls the production of light of each color, such that the correct light is shown at the correct location of viewing screen 40. Controller 42 may be separate from light source 38, such that these two components are not combined into a single component. In alternate embodiments the two components may be provided in the same device. In one embodiment of system  36, light source 38 projects light of at least seven colors, without being able to control the location of the projected light onto viewing screen 40. Controller 42 then determines the relative location of light of each color as projected onto viewing screen 40, for example with a spatial light modulator and/or another system of mirrors and/or lenses. In order for controller  42 to be able to determine the correct light for being displayed at each portion of viewing screen 40, controller 42 optionally receives data from a data input 45, which may optionally be digital or analog. Most preferably, controller 42 also receives instructions and/or commands from a converter 46, which lies between data input 45 and controller 42. Converter 46 converts the data from data input 45 into a format which is suitable for controller 42, and also includes any necessary instructions and/or commands for enabling controller 42 to be able to understand the data. Converter 46 may be implemented in software, hardware, or a combination thereof. Optionally, converter 46 may also convert the data from an analog signal to digital data, such that controller 42 is only required to receive digital data. Preferably, converter 46 is able to determine the appropriate combination of light of at least seven different colors in order to accurately represent the color image data with displayed colors which spectrally match or substantially spectrally match the colors of a certain printed material, such that the appearance of the displayed image matches or substantially matches the appearance of a certain set of inks as printed onto the paper of the printed material. In alternate embodiments, converter  46 is able to determine the appropriate combination of light of another number of primary colors in order to accurately represent a set of ink transmission spectra. For example, three or four primaries may be combined to reproduce seven transmission spectra. In other embodiments, other numbers of transmission spectra may be reproduced, for example if proofing for ink systems producing different numbers of transmission spectra are desired to be created. A system  48 according to one embodiment is based on passing white or substantially white light from a source 20 through a spectrum-correcting filter 22 in order to attempt to match the spectrum of the light to at least one of, and more preferably both of, the relevant required illumination conditions and the relevant paper (or other printing substrate) reflectance spectrum. Spectrum-correcting filter 22 optionally and preferably includes two tonal components: a first functional component for correcting the spectrum of light with regard to the required illumination conditions and a second functional component for correcting the spectrum of light with regard to the relevant printing substrate reflectance spectrum. These two functional components are optionally implemented as two separate parts of spectrum-correcting filter 22, but alternatively may be implemented in a single physical device. The brightness of the light is optionally and preferably controlled by adjusting the amount of power supplied by a power supply  23 or by a variable neutral density filter. The spectrally-corrected light passes through appropriate color filters 52 to form colored light of a defined spectral range. As previously described, system 48 preferably uses at least seven such colored filters 52 (six colors+white), which as shown may optionally be configured in a color filter wheel 24, but may optionally include other numbers of filters or primaries. In order for the light to be directed through the appropriate filter  52, preferably the light is focused by a condenser lens 21, optionally implemented as two such lenses 21 for the purposes of illustration only and without any intention of being limiting. In alternate embodiments, various components, such as the condenser, may be eliminated. The focussed light is then directed through one of the filters on filter wheel 24, which holds the color filters 52. In this example, the combination of light source 20, spectrum-correcting filter 22 and color filters 52 can be considered to form at least part of the light source of FIG. 2A above, optionally with other components involved in the production of the light itself. Preferably, the colored light illuminates a spatially modulated mask  26, also known as an SLM (spatial light modulator) which determines the particular color for being displayed at each portion of the image (typically according to each pixel), by determining whether light of that color is permitted to pass for illuminating that pixel. For example, a digital micro-mirror device (DMD) by Texas Instruments or Ferroelectric Liquid Crystal (FLC) SLM by MicroPix, Displaytech and other vendors may be used. The colored light for this image is then projected by a projection lens  28 onto a viewing screen 29. Viewing screen 29 displays the resultant colored image to the user (not shown). Spatially modulated mask 26, and preferably the combination of spatially modulated mask 26 and projection lens 28, can be considered to be an example of the controller from FIG. 2A. In alternate embodiments other controllers and methods for controlling the system may be used. Preferably, a motor  63 rotates filter wheel 24 in front of light source 20, so in each turn spatially modulated mask 26 is illuminated by the colors in filter wheel 24 sequentially. Preferably, the rate of rotation is at the frame frequency, which is the frequency at which the full-color image on viewing screen 29 is refreshed. Preferably, the loading of the data into spatially modulated mask  26 is synchronized by a timing system 207, according to the rotation of filter wheel 24. The light beam is spatially modulated by spatially modulated mask 26, so that the apparent brightness of each primary color varies at different portions of viewing screen 29, typically according to each pixel of the image. Each position 68 on viewing screen 29 is preferably associated with a certain pixel 70 in spatially modulated mask 26. The brightness of that position is determined by the relevant data pixel in the image. The values for the pixels of the image are optionally and preferably retrieved from an image data file 201. The human viewer integrates the sequential stream of the primary images to obtain a color image which spectrally matches or substantially spectrally matches the image on paper. In further embodiments, other methods of producing primaries and displaying primaries may be used, and other light delivery mechanisms using different sets of components may be used. For example, an SLM need not be used. Exemplary but preferred implementations of various components of the above projection display system are now given in greater detail. Spectrum-correcting filter  22 may correct for at least one of, and preferably both of, the required illumination conditions and the relevant paper or printing substrate reflectance spectrum. One standard illumination in the printing industry is D50 illuminant (D65 in US; both are daylight illumination, from a black body at 5000K and 6500K respectively through the atmosphere), but other illuminants, such as illuminant A (tungsten lamp, typical for indoor illumination) and 9300 K illumination (typical for light outdoors, under a blue sky without direct sunlight) are also common. The lamp itself has a spectrum, which is typically, but which may not be, very different from these illuminants (and depends on the type of the lamp, e.g tungsten, halogen, metal-halide, Xenon and others). Therefore, the spectrum of the omitted light may be corrected. The illumination correction is preferably obtained by placing spectrum-correcting filter  22 with a transmission spectrum Tƒ(λ) after light source 20. The filter spectrum is given by Tƒ(λ)?Si(λ)/SL(λ), where SL(λ) and Si(λ) are light source 20 and the required illuminant spectra respectively. The light passing through spectrum correcting filter 22 has a spectrum preferably identical or substantially identical to that of the required illuminant. These types of filters are based on color temperature conversion filters in combination with narrow notch filters, which are applied if the lamp spectrum contains narrow spectral lines, which may be rejected. The design of such filters is known in the art. FIGS. 9 a-9 d depict spectra of various white lights, a correction filter, and the spectrum resulting from the use of the correction filter, according to an embodiment of the present invention. FIG. 9a depicts the spectra of a lamp currently marketed as the Osram™VIP lamp. FIG. 9b depicts the spectra of a D50 equivalent fluorescent lamp. A correction filter having a spectrum as shown in FIG. 9c may be applied to the spectrum of FIG. 9a to produce the spectrum of the solid line in FIG. 9d, which substantially matches the spectrum of FIG. 9b. Both spectra have substantially the same color temperature and a high color rendering index. In alternate embodiments, other correction spectra may be applied. A spectrum of spectrum correcting filter  22 according to one embodiment for correcting for paper reflection and construction thereof are shown in FIG. 6A. The yellowish tint may be obtained with, for example, a long-wavelength cut-off filter with density in the range of 0-0.1, shown in FIG. 6B. The light is impinging on a relatively small area of the filter. The blue part of the spectrum is enhanced or reduced according to the relative density in the blue part of the spectrum with respect to the rest of the spectrum at the position of incidence. The color of the transmitted light is adjusted by shifting the placement of the filter along the x-direction, and thereby changing the relative density of the filter which filters the light, until the white area on the screen has the same color as that of the paper. Other spectrum correcting filters or methods may be used. Such filters or methods may be operator selectable or adjustable to enable correction for multiple light sources or papers. In one embodiment, transmission spectrum of color filters  52, of which there are preferably at least seven, is preferably very close to that of a set of standard inks (and overlaps), used in the relevant printing facility. Optionally, colored filters 52 are implemented as seven color filters 52 are C(yan), M(agenta), Y(ellow), R(ed), G(reen), B(blue) and white. Other numbers of color filters and other spectra may be used. Other embodiments may use combinations of primaries to reproduce such transmission spectra. Preferably, the transmission of the white filter of color filters  52 is close to 100% and to be almost independent on wavelength in the visible range of the spectrum. The white light is optionally implemented as an anti-reflection coated glass filter with suitable transmission properties. In alternate embodiments the production of the white light may be different, and may use other spectra. In one embodiment, the transmission of the filters  52 is close to that of typical process inks (and resulting overlaps) used in the print material to be reproduced. Thus the filters and primaries used depend on the set of inks to be reproduced; different inks may result in different sets of filters and primaries. The transmission spectrum of one set of C M Y process inks and of R G B overlap colors is shown in FIGS. 4A and 4B. Such filters 52 can alternatively and optionally be realized as gelatin filters with the same or similar pigments as used for the inks or even alternatively and optionally as interference filters. Another possibility is to use inkjet printers or offset machines, with special inks such as UV inks for example, that can adhere to glass or transparent plastics, to print colored filters 52. In alternate embodiments other filters or forms of filters may be used. An embodiment using liquid crystal modulators uses polarized light, which is the preferred embodiment for FIG. 2. For reflecting devices, such as Liquid Crystal Over Silicon (LCOS) devices, the same polarizer, usually a polarizing cube beam splitter, can be used for polarizing the incident light and for analyzing the reflected light. The exemplary but preferred implementation shown in FIG. 2 is based on a reflecting LCOS device for spatially modulated mask  26, and therefore a polarizing cube beam splitter 25 may be included in system 48, from which polarized light 27 is transmitted to projection lens 28. It should be noted that this is for the purposes of illustration only, and other implementations of system 48 are also possible as based on other modulators, such as those devices which are described as examples of other such spatial modulation devices. An exemplary description of the flow of data and data handling is also shown with regard to FIG. 2B. The data is optionally given as a digital CMYK image file  201 as shown; other input data formats may be used. The data optionally and typically arrives in a raster format, particularly for display systems associated with computers. The raster format may be, for example, a signal presenting the C, M, Y and K values pixel-by-pixel, line-by-line for an image. In this process, the data system evaluates the spectrum obtained from the inked paper for a certain CMYK combination, and the linear combinations of the display filters that reproduce this spectrum are found and presented by the optical engine on the viewing screen. Preferably, the transition is not done through the spectrum, but instead printer models such as, for example, Murray-Davis-Neugebauer or Celluar Neugebauer are applied in combination with a transformation matrix from the Neugebauer spectral primaries to the spectral filters to obtain directly the resulting values to form the CMYK data. Preferably, the data system rearranges the resulting data in a format consistent with the physical SLM (spatially modulated mask  26), and loads the data into spatially modulated mask 26 at the required timing for producing each color in a sequential (time-based) projection system. In other embodiments, the data system may perform other functionality, and the functionality may be performed by other systems. In the case of CMYK input data, referring to FIG. 2B, the input CMYK image file  201 contains the data of the four-color separations. Each of the color separations of the CMYK file may be processed by a one-dimensional look-up table (I-D-LUT) 202, to correct for the dot gain print effect of the printing process. In alternate embodiments, dot gain correction need not be performed or may be performed in other manners. The resulting CMYK channels are transformed by a transformation module 203 into multi-primary data, such as RGB CMY white data, as described below. The color channels may pass through a print effect simulation module 204 described below. If the primaries of the display do not match the spectra of the print inks, the data may be converted by a conversion unit. The print primary data is converted to data representing the proportions of the display primaries used to display the print data. For example, RGB CMY white data may be converted to display primaries values. If the display primaries are identical to the ink spectra used, conversion may not be required. The data may be processed by a gamma correction module 205, to aid in producing a linear response by spatially modulated mask 26. The data channels are formatted and loaded through frame buffer and formatter 206 one after the other into spatially modulated mask 26. In alternate embodiments other methods of converting data may be used. The implementation of the Demichel transformations can be done in software or hardware. Demichel Equations are described in various articles and references (see for example “A Critical Review of Spectral Models Applied to Binary Color Printing”, by Wyble and Berns,  Color Research and Application, vol. 25, 2000, pages 419). Assume that there is a printing dot for which the values of the different inks are given by C, M, Y and K (C,M,Y,K <1). This implies that a portion C of the printing dot is covered by Cyan, a portion M by Magenta and so on. Therefore, (1−C) of the dot area is not covered by Cyan, 1−M is not covered by Magenta, and so forth. 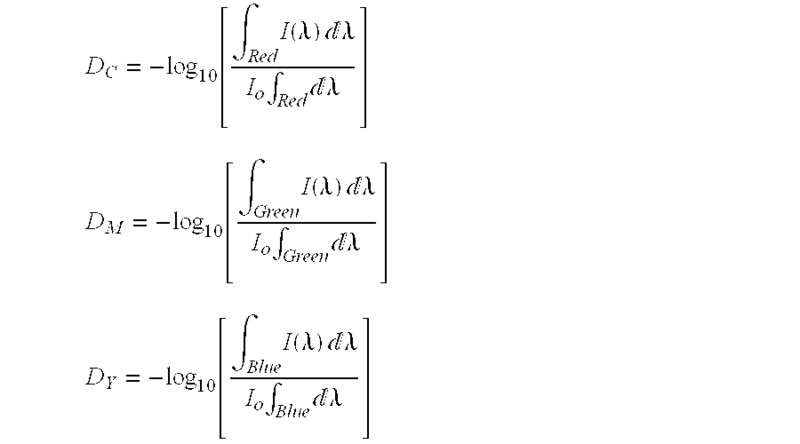 To determine the area which is covered by Cyan only, the equation Fc=C (1−M) (1−Y) (1−K) is obtained. This is the logic of Demichel equations as described in the above-referenced article (further assuming that CMY overlap is equal to black). where R  i(λ) are the spectral reflectivity of the elementary colors i=RGB CMY K, W, and Fi are relative proportions of the elementary colors defined above using Demichel equations. Ri (λ) depends on the illumination conditions via Ri(λ)=S(λ)RW(λ) Tt(λ), where S(λ) is the spectrum of the incident light, RW(λ) is the reflectance of the white paper and Ti(λ) is the transmission of the ith elementary color (ink or overlap of inks). It is usually assumed that the transmission of black layer TK(λ) is zero or negligible over the whole spectral range, however, correction for finite small transmission can also be implemented. The resulting color data is then optionally processed by a print effect simulation module  204, which is further described below. Conversion of these seven (or more) Neugebauer coefficients to display primaries values is preferably performed. If less than seven primaries are used (e.g., three to six primaries) the intermediate data (e.g., RGB CMY White data) is transformed into the relevant data for these primaries. In one embodiment, the data is transformed using a transformation matrix. In alternate embodiments, other transformation methods may be used. Furthermore, in alternate embodiments a set of X primaries each not matching any of a set of X transmission spectra may be combined to substantially reproduce those X spectra. Then, the N-primary color channels are preferably subjected to a gamma correction process for the response of spatially modulated mask  26 by an optional gamma correction module 205. The gamma-correction module 205 performs a non-linear transformation for each of the data channels, in order to correct for non-linear properties of the physical device, in such a way that ultimately the combined response of the data and the physical device is linear. Namely, if by loading a value R directly to the physical display, a brightness f(R) is obtained which is not linear on R, the gamma-correction is a one-dimensional transformation for the R channel that has the response g(R)=f−1(R). The data R is transformed to g(R) and then the response of the physical device is f(g(R))=R, which is therefore linear on R. Preferably, this transformation is performed by applying several look-up tables (one or more for each channel), which contain the output values corresponding to all possible input values. The use of such look-up tables provides for a standardized, corrected, linear output which can be more precisely displayed with an embodiment of the system of the present invention. In alternate embodiments other gamma correction methods may be used. The data is transferred to the display mechanism. While in one embodiment the display mechanism relies on projected light, in alternate embodiments methods such as LCDs or LEDs may be used. In an exemplary embodiment, the data is transferred to the frame buffer and formatter  206, which arranges the data in a format acceptable by spatially modulated mask 26, and provides the correct electronic and physical interface to spatially modulated mask 26. Frame buffer and formatter 206 also arranges the stream of data in a format consistent with the electronic requirements of spatially modulated mask 26. Preferably, frame buffer and formatter 206 is a memory device for holding the data of the image. Typically, the data is held in the same geometrical arrangement as the pixels of the image, and of spatially modulated mask 26. For the system described above, the frame buffer itself, of frame buffer and formatter  206, is preferably divided into bit planes. Each bit plane is a planar array of bits, in which each bit corresponds to one pixel on spatially modulated mask 26. Each bit plane actually represents at least a part of the data for each color, such that if a pixel is to have a component which includes a particular primary color, that pixel is represented by a particular bit on the appropriate bit plane which features that primary color. The bit planes are arranged one below the other to form a three-dimensional arrangement of the data, from the most significant to the least significant bit. There are m×N bit planes (m is the number of bits/color channel, N is the number of color channels). The data which is sent to spatially modulated mask  26 represents a “gray level” of each of the colors, and may be presented as, for example, 8 bits (256 levels) per each primary. The various “gray levels” of the illumination can be achieved in different ways depending on the type of spatially modulated mask 26 which is used. For “analog” modulators, such as nematic LC modulators for example, the gray level is determined by the amount of the optical axis rotation, controlled by the voltage applied to the device. Each frame may require a set of “updates”, or changes to the configuration, of spatially modulated mask 26, with one update for each of the primary colors of color filters 52. For a frame refresh rate of 50 Hz for viewing screen 29, and for seven primaries, this corresponds to an update rate of 350 Hz. Other update rates may be used. The eight bit planes corresponding to the relevant color are retrieved from the frame buffer itself, of frame buffer and formatter 206, and are optionally and preferably transformed into analog signals. These analog signals are then amplified and applied to spatially modulated mask 26. Other methods of projecting the primaries may be used. For the “binary” type of spatially modulated mask  26, such as digital micro-mirror devices (DMD) by Texas Instruments or Ferroelectric Liquid Crystal (FLC) SLM by MicroPix, Displaytech and other vendors, gray levels are achieved by pulse width modulation (PWM) of the light, a technique which is well known in the art. In order to perform pulse width modulation of the light, m bit planes, shown here for m=8 planes, for each primary color are loaded into spatially modulated mask 26 during the period for displaying the relevant color. For a frame rate of 50 Hz and a seven color filter display, the time for each color to be displayed is 20 ms /7=2.85 ms (20 ms=1/50Hz). During this time, 8 bit planes are loaded into spatially modulated mask 26, resulting in an update rate of 2.8 kHz. However, if PWM is applied to the light, the least significant bit plane is preferably presented on spatially modulated mask 26 for only 11.2 microseconds. To extend the display period and therefore to avoid such a rapid refresh or change rate for spatially modulated mask  26, optionally and preferably PWM is not applied to the light. Instead the illumination time is preferably divided uniformly between the bit planes. The different bit values are then optionally and more preferably created by changing the brightness of light incident on spatially modulated mask 26. The brightness of the incident light is optionally and most preferably altered by using a continuously varying neutral density (ND) filter, as described in greater detail below. The loading of the data into spatially modulated mask  26 is preferably synchronized by a timing and control system 207, according to the rotation of color filter wheel 24. An embodiment of the system of the present invention is capable of projecting images, determined by the data, of different colors onto a viewing screen. The preferably temporal integration of the different frames of different colors creates the sensation of the required color. The illumination conditions may be replicated by adjusting the white light color and brightness to that reflected from the paper, using the spectrum correcting filter and power supply  23. By choosing the transmission spectra of the colored filters 52 to be substantially identical or identical to that of light passing through the inks and the overlaps, or by choosing the transmission spectra so that the spectra of light passing through the inks may be reproduced by linear combinations of the filter spectra, a match or substantial match between the behavior of inks on paper and the display may be achieved, as implied by Neugebauer equation. The creation of a complex color sensation, by spatial integration of ink dots of different elementary colors, is replaced by temporal integration of images of the same elementary colors. The color sensation in this method is substantially identical or identical, in principal, to the way it is achieved in printing, and thus good color match and control over varying conditions is easier to achieve. According to preferred embodiments of the present invention, there is described a method for simulating print effects, such as ink trapping, dot gain, lower ink densities, gloss, and other effects, for example, by using the system and device of embodiments of the present invention. These effects are preferably simulated using the print effect simulation module  204 in the data system. Trapping may be associated with the difference between ink adhesion on paper and adhesion of ink on ink (see FIG. 3). This may be important for the overlap RGB colors. If perfect trapping occurs the thickness of the overlapping layer  31 is the same as the thickness of the same ink layer on paper (FIG. 3A). However, in many cases, an ink layer 41, which is impressed on top of another ink layer 42, is thinner than that printed directly on paper (see FIG. 3C). In FIG. 3A white light (30) passes through a perfectly trapped layer of yellow ink (31) and a layer of magenta ink (32), incident on the paper (33), and reflected back through the same layers to give red light (34); FIG. 3B shows ideal transmission spectra of the yellow (61) and the magenta (62) inks, together with the spectrum of the red light (64) going through these layers. In FIG. 3C, non-ideal trapping is shown, in which the yellow ink layer (41) is thinner than that in the case of perfect trapping (31). In FIG. 3D the transmission spectrum of the poorly trapped yellow layer (71) and the magenta layer is shown together with the spectrum of the light (44) going through these layers, in addition to the red portion of the spectrum (75) additional blue component (76) is also present. The ratio between the thickness of the overlap layer and that of the same ink printed directly on paper is a measure of trapping. Usually, this value is about 75%, however it may vary depending on paper type and the set of inks used. This variation results in a change in the color perception of the overlapping elementary colors RGB. To explain the ink trapping simulation, an idealized situation is assumed, where there is no overlap between the spectral regions corresponding to RGB (see FIG. 1). Each one of the CMY inks blocks one of the RGB components of light to large extent, and transmits the other components perfectly. For perfect trapping, the overlap of two inks, such as M(agenta)  32 and Y(ellow) 31, for example, results in a red color 64 plus some minor residues of green and blue. This small amount of green and blue are due to the imperfect blocking of the M and Y inks (which transfer some G(reen) and B(lue) respectively). If the trapping is not perfect, the thickness of the yellow ink layer 41 on top of the magenta layer 42 is smaller. The amount of the red (and green) spectral components 75 of the reflected light 44 does not change, but more of the blue component 76 is transferred, due to the reduced blocking of the yellow layer 41. For example, the amount of blue passing through the blue-blocking Y ink is given by 10 −D Y, where DY is the density of the yellow inic When the trapping is not perfect, the amount of blue light transferred is 10−D Y t (t is the trapping ratio). Assuming that the magenta is completely transparent to blue, the amount of blue that may be added is αB=10−D Y t−10−D Y. Thus, the blue signal sent to the SLM is given by Bt(i,j)=B(i,j)+αB[R(i,j)+G(i,j)], where i and j are pixel coordinates, and B, R and G are the original signals calculated from the Demichel equations. In a similar manner, the green signal is corrected by the additional amount contributed by the imperfect trapping of B (CM). It should be noted that although the magenta is assumed to be completely transparent to blue, this is not a prerequisite, and the correction can use a similar procedure by including the effect of the blue absorption in the magenta layer. Other methods for adjusting the primary signals, and other adjustments, may be used. and the same calculation applies. Here, t R, tG and tB are the trapping parameters for the R, G, B overlaps respectively. Both the trapping and the density corrections may result in the change of the print primaries (Neugebauer primaries) from their nominal values. This change is similar to that which occurs between the Neugebauer primaries and the display filters; this may be processed within the conversion matrix or by other methods. The transition from C(i,j)→C′(i,j) and W(i,j)→W′(i,j) discussed above with relation to change of density, and similar relations discussed in the trapping case may be considered linear combination of primaries that can be handled by matrix manipulations. Other correction methods may be used. FIG. 7A shows an illustrative implementation for the filter arrangement of the color wheel with such an ND filter  52. The color filter wheel is divided into several color sections, labeled as “C1” to “C7” respectively, the width of each is 2π/N radians, where N is the number of primary colors. Other numbers of sections may be used. As described in greater detail below, each color section is a different color filter, which preferably has a separate ND filter. The ND filter does not affect the spectral content of the filtered light, but rather alters the intensity of the filtered light over the entire spectrum. The timing sequence for operation of color filter wheel  52 is depicted in FIG. 7B. The duration of a full rotation of the color filter wheel is 2π/ω, each color section has a? time slot of 2π/ωN, during which m bit planes are loaded into the spatially modulated mask. Each bit plane occupies equal time duration and at after the last significant bit loading, a dead zone exists. To achieve the correct dependence between light intensity and the corresponding bit value, a continuously varying ND filter is placed in each color section of filter 52. The density of the ND filter varies linearly θ from zero density to a density of m·log102≈0.3m, m being the number of bits/channel, as shown in FIG. 7C. In the transition region (the dead zone), from the least significant bit (lsb) of one color to the most significant bit (msb) of the next color the density increases to a higher value to avoid color mixing. As shown below, this design helps to ensure that the brightness of light deflected from i-bit plane has, in one embodiment, an almost linear dependence on the value of ith bit. A gamma-correction look-up table (LUT) compensates the remaining non-linearity as explained above. Other methods of using a neutral density filter may be used. Referring to FIG. 11, in step  100, image data is accepted. In an exemplary embodiment, this image data is in a CMYK format, but may be in other formats. In step  110, the image data is converted into a set of data corresponding to the primaries of the display. In an exemplary embodiment, this involves evaluating the spectrum obtained from the inked paper for a CMYK combination, and reproducing a set of linear combinations of the primaries that reproduce this spectrum. Corrections or modifications may be made to the resulting combinations. In alternate embodiments, the image data need not be converted, or may be converted using different methods. In step  120, the resulting data is displayed by the monitor. a controller combining the set of primary colors to substantially reproduce the transmission spectra. 2. The display of claim 1 comprising a correction filter, the spectrum of the correction filter being based on the spectrum reflected from a type of printing substrate. 3. The display of claim 1 comprising a correction filter, the spectrum of the correction filter being based on the spectrum of an intended light used to view the printed matter. 4. The display of claim 1 wherein the light source includes at least a plurality of LEDs. 5. The display of claim 1, wherein the light source includes at least a color wheel. 6. The display of claim 1, wherein the light source includes at least four colors. 7. The display of claim 1, wherein the light source produces three primary colors. 8. The display of claim 1 comprising at least two color wheels. 9. The display of claim 1 comprising at least two light sources each generating a set of primary colors. 10. The display of claim 1 comprising a spatial light modulator. 11. The display of claim 1 comprising a digital micro-mirror device. a controller means combining the set of primary colors to substantially reproduce the transmission spectra. displaying the set of primaries. 16. The method of claim 15 comprising converting the data corresponding to the image to intermediate data corresponding to the set of transmission spectra. 17. The method of claim 15 wherein the data corresponding to the image represents the proportions of the inks, the method comprising converting the input data corresponding to the image to intermediate data corresponding to the set of transmission spectra; wherein the step of determining the proportion of the primary includes at least converting data from the set of transmission spectra using a matrix. 18. The method of claim 15 comprising converting the data corresponding to the image to a set of data determining the proportion of the primaries using Demichel equations. 19. The method of claim 15 comprising converting the data corresponding to the image to intermediate data corresponding to the set of transmission spectra using a matrix. 20. The method of claim 15 comprising, for each of the transmission spectra, reproducing the spectra using a set of proportions of the primaries. 21. The method of claim 15 comprising passing light through a correction filter, the spectrum of the correction filter being based on the spectrum reflected from a type of printing substrate. 22. The method of claim 15 comprising passing light through a correction filter, the spectrum of the correction filter being based on the spectrum of an intended light source used to view the printed matter. 23. The method of claim 15, wherein the step of displaying the set of primaries includes at least producing light using a plurality of LEDs. 24. The method of claim 15 comprising passing light through a color wheel. 25. The method of claim 15 wherein the plurality of primaries includes at least four colors. 26. The method of claim 15, wherein the plurality of primaries includes three colors. 27. The method of claim 15, wherein the primaries are disposed on at least two color wheels. 28. The method of claim 15 comprising displaying the set of primaries using at least two light sources each generating a set of colors. 29. The method of claim 15 comprising passing the set of primaries through a spatial light modulator. 30. The method of claim 15 comprising passing the set of primaries through a digital-micro mirror device. 31. The method of claim 15 comprising correcting for dot gain effect. a light source generating a set of primary colors, wherein the spectrum of each of the primary colors is substantially similar to the one of the transmission spectra. 36. The display of claim 35 comprising a set of filters, wherein for each of the filters the spectrum of the filter is based on one transmission spectrum of the transmission spectra. 37. The display of claim 35 comprising a correction filter, the spectrum of the correction filter being based on the spectrum reflected from a type of printing substrate. 38. The display of claim 35, wherein the printed material is meant to be displayed under an illumination condition, the display comprising a illumination correction filter, the spectrum of the illumination correction filter being based on the spectrum of the illumination condition. 39. The display of claim 35, wherein the light source includes at least a plurality of LEDs. 40. The display of claim 35, wherein the light source includes at least four colors. a set of filters, for each of the filters the spectrum of the filter being based on one transmission spectrum of the transmission spectra. 43. The method of claim 42, comprising projecting light through a set of filters, wherein for each of the filters the spectrum of the filter being based on one transmission spectrum of the transmission spectra. 45. The method of claim 42 comprising passing light through a correction filter, the spectrum of the correction filter being based on the spectrum reflected from a type of printing substrate. 45. The method of claim 42, wherein the printed material is meant to be displayed under an illumination condition, the method comprising passing light through an illumination correction filter, the spectrum of the illumination correction filter being based on the spectrum of the illumination condition. 46. The method of claim 42 comprising passing light through a color wheel including at least four colors. (d) a viewing screen for displaying the image data according to said proportion from said controller. (e) a projector for projecting light of said at least four primary colors onto said viewing screen according to said proportion. (ii) at least four color filters, each color filter corresponding to an ink transmission spectra. 50. The device of claim 47, wherein said projector comprises a spatial light modulator for determining a path of light of each primary color. 51. The device of claim 47, wherein said light source comprises a continuously variable neutral density filter for controlling brightness of said light of said at least four primary colors. 52. The device of claim 47, wherein said at least one characteristic of the printed material is determined according to a transmission spectrum of a combination of inks. 53. The device of claim 47, wherein said light source for producing light having at least four primary colors is selected such that a spectrum of said light having at least four primary colors is matched to said at least a portion of a spectrum of a combination of inks. 54. The device of claim 47, wherein said at least one characteristic of the printed material is determined according to a color reflection characteristic of a material for receiving said combination of inks. 55. The device of claim 47, wherein said at least one characteristic of the printed material is determined according to a spectrum of a combination of inks, and wherein a brightness of said light having at least four primary colors is adjusted according to illumination conditions for said material for receiving said combination of inks. 56. The device of claim 47, further comprising a white light source for producing white light, wherein said illumination conditions are adjusted according to an amount of said white light being produced. wherein said at least one characteristic of the printed material is also determined according to a spectrum of at least one ink, and said filtered light is adjusted according to a density of said at least one ink compared to said filters. 58. The device of claim 47, wherein a saturation of said light having at least four primary colors is adjusted according to a gloss of said material, said material for receiving at least one ink. (d) projecting said light of each primary color according to said path onto the viewing screen to form the image. (d) displaying the image data with said combination of said light of said plurality of colors. 61. The method of claim 60, wherein each color of said light is substantially spectrally matched to each color of said colored materials. 62. The method of claim 60, wherein step (b) is performed with a projective light system, said projective light system featuring a light source for producing said light of at least four colors, and a viewing screen for receiving said light for displaying the image. (d) displaying image data on the viewing screen with said light of step (c). projecting light through a set of filters. accepting data corresponding to the image of the printed matter; for a plurality of primaries determining the proportion of each primary so as to substantially reproduce each of the set of transmission spectra; and displaying the set of primaries. a controller combining the three colors to substantially reproduce the transmission spectra. 71. The method of claim 70 comprising converting the data corresponding to the image to intermediate data corresponding to a set of transmission spectra produced when light passes through the inks when on the printing substrate. 72. The method of claim 71 comprising passing light through a correction filter, the spectrum of the correction filter being based on the spectrum reflected from a type of printing substrate. 73. The method of claim 71 comprising passing light through a color wheel.